- A Christmas tree decorates the garbage bins in front of 331 Keap Street. 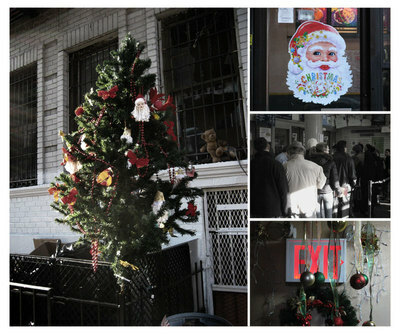 - A Santa decoration on the door of a Chinese take out establishment on Marcy and Broadway. - The long lines at the Williamsburg Post Office. - Hallway decorations at 331 Keap Street. Photos taken on December 18th, 2007. This page contains a single entry from the blog posted on December 24, 2007 9:05 PM. The previous post in this blog was Kellogg's Diner Renovations. The next post in this blog is Johnny Rotten Spells Relief.